Scent In The Garden or Not! Whilst I was designing and building the garden on the north side of Dovewood, I was thinking about scent in the garden. All plant purchasing was suspended for this part of my domain but that didn’t stop me from writing my shopping Wish list. I was spurred on by the delightful scent of the Philadelphus in next door’s garden, wafting over the fence. 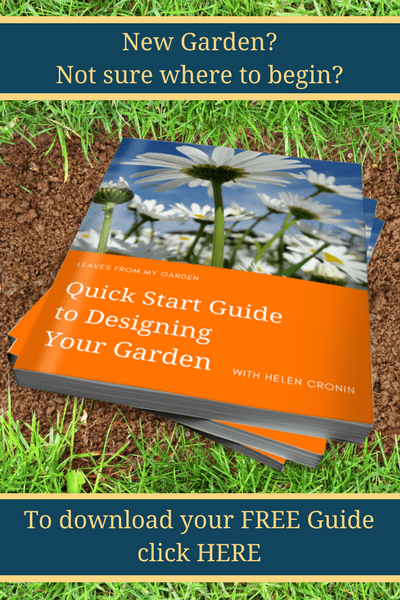 I have collected plant ideas from books, magazines and even a mini lecture at the local Garden Centre. I was delighted to read about Hamamelis in one magazine, and knowing that part of the new design would include some large vintage galvanized cheese making containers that I could fill with Ericaceous compost and acid loving plants, I set my heart on buying a Hamamelis. Fortuitously towards the end of last year I received a Garden voucher from a couple of ladies I had helped with designing their gardens. So I set off to pay a visit to one of the Garden centres in my area. The place was sadly run down but I spied some Hamamelis and yes! they had the very one I had set my heart on. Hamamelis ‘Arnold Promise which I had read has the best scent of all. Unusually, it had seed pods on the branches, and I was informed that they don’t often set seed. This was a bonus point for plant interest. Bearing my prize triumphantly home (along with some other plants, of course!) I duly planted it and patiently waited for it to flower. In early February one or two of the buds cracked open, in the warm sunshine we had for a couple of days, to give me a glimpse of the colour within. My joy knew no bounds. I waited impatiently for warmer weather and it finally bursting into a flurry of blossom and heady scent. The time came and it was, indeed, covered in the extraordinary blossom Wych Hazels are known for. But sniff as I might, there was no discernible scent. Oh! The disappointment! I huffed, and then I sniffed the blossoms hoping the warmth of my breath would release the scent. All to no avail, nothing, zilch, nada. I was so disappointed. 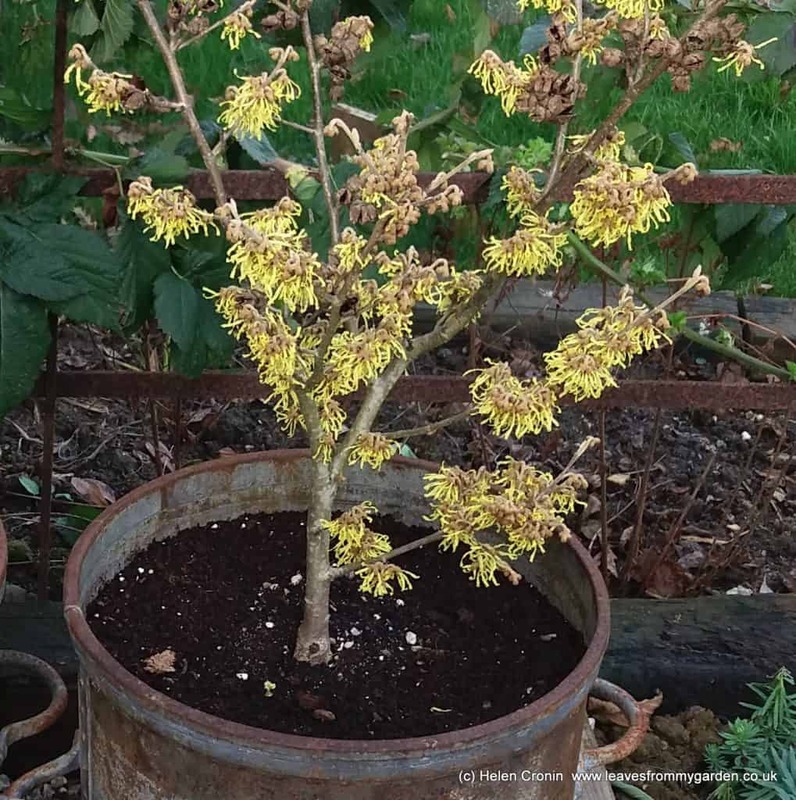 Do I own the only Hamamelis ‘Arnold Promise’ with no scent? Did I mis-read the Article or the label? Or has it a scent that I personally cannot smell? A recent Article suggested that people react differently to some scents. Their olfactory response to certain ‘smells’ is at odds to the accepted norm. I’m sorry to say I don’t remember what it said the particular fragrances were. Could this be me? However, recently I realised how different scent can be, and how it can change. I was once given a big bunch of Daffodils into which I plunged my nose. I decided that they smelt like the warm rubber of wellington boots! The next day the Daffodils had gently fragranced the Dining room with a lovely scent. 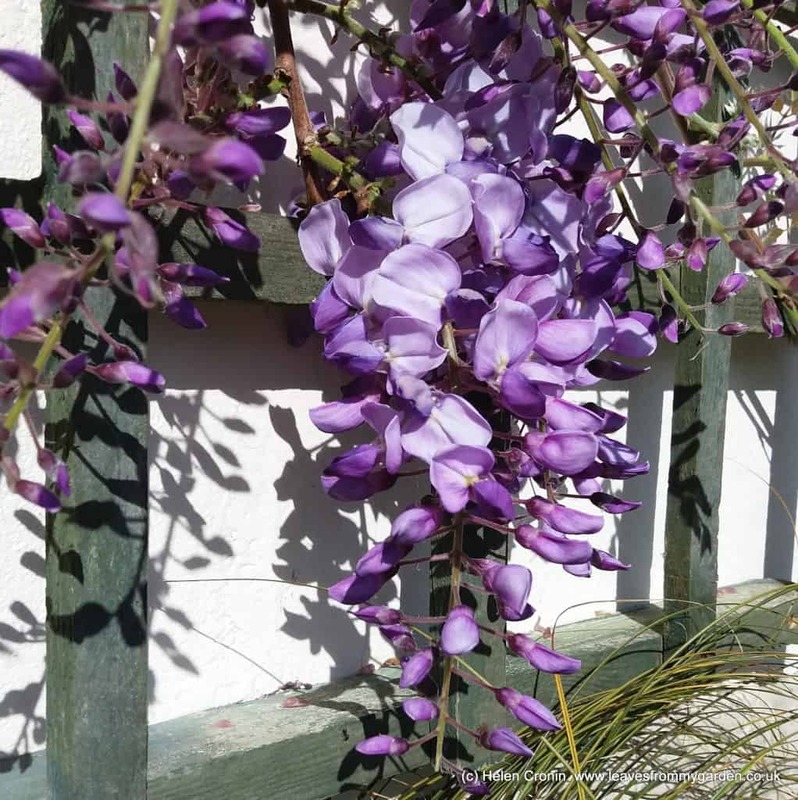 Although Wisteria are renowned for their beautiful racemes of pea-like flowers, some exude a heady fragrance too. At the time of writing our Wisteria is just coming into flower. In a few more warm days it will be filling the garden, and my home, with its scent. Other plants also best known and most often chosen for their flowers have some scented members of their families too. For example, some Tulips, the annual Lupin, and the Azalea luteum, which is a delightful surprise and added bonus. The saddest thing is the plant group renowned for its scent, which is then to be found sadly lacking. Some modern day hybrid Sweet Peas have little or no scent. It has been sacrificed by the Plant Breeders in favour of showier flowers. Likewise, Roses too, although in both cases, I think this is being redressed. 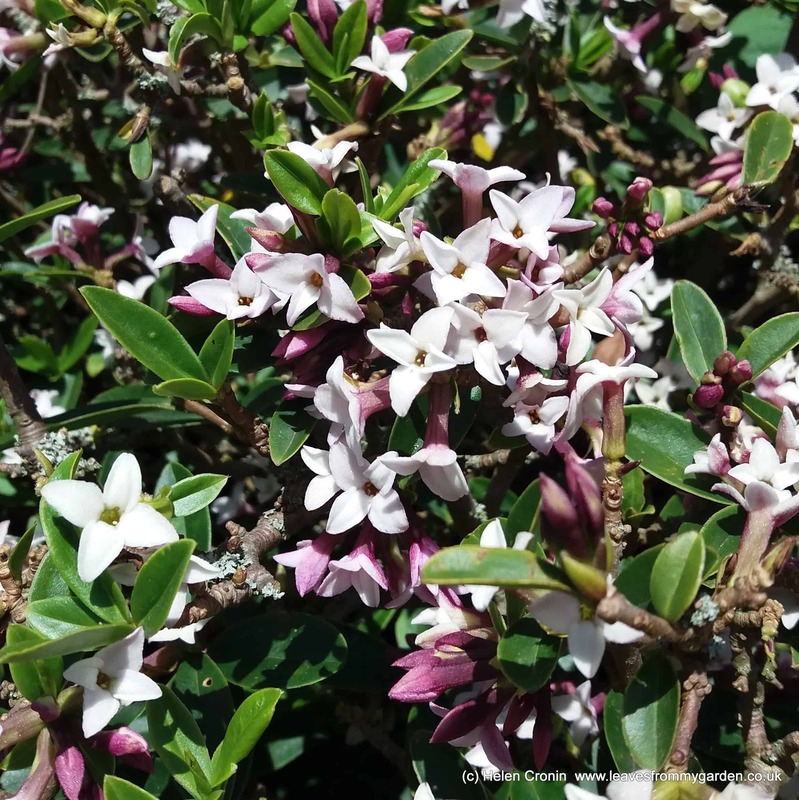 Along the road, near to where I live, is a large round bush of an unknown variety of Daphne which blooms incredibly well. Every year I plunge my nose into it (as it grows at head height) only to pull back in disappointment – it has NO scent! Horror! A Daphne with no scent! Perhaps scent is not important to some gardeners but for me I have to have it. For me scent it is like bread with bread, strawberries with cream or scones with strawberry jam. I just can’t have flowers that should have scent with no fragrance! If I have a choice of plants within a Species I have set my heart on, I will always go for the one with scent unless, of course, it reeks of Vanilla! I can’t stand that! No Gardenias here, please! Similarly the Mexican Orange which sounds as if it should have a delightful fruity fragrance, and the flowers may do. However the foliage, with which one has to live with, all year round, smells of tom cat. No room for them in MY garden! However some scent will arrest your nostrils and cause you to stop mid-stride, as happened to me last Autumn. I was walking in the grounds of the National Trust property Kingston Lacy and surprised by the scent of burnt sugar! The falling leaves of Cercidyphyllum japonicum also known as the Katsura tree – really do smell like burnt sugar and candy floss! Quite extraordinary! But other scents will have you hunting high and low. Some inconspicuous flowers give off a powerful fragrance that belies their size, unless of course you happen to know what you are looking for. Elaeagnus ebbingei and Sarcococca have both caught me out. The former, is a large rather boring looking evergreen shrub can easily be overlooked. (The juvenile branches are colourful though). Whilst the latter shrub was hidden behind a wall. I haven’t room for an Eleagnus here. But I have planted two Sarcoccoca or Christmas box near windows. I can enjoy the scent without having to step out into the garden in inclement weather. There is one plant, however, that if I could, I would bottle its scent so I could enjoy it all year. 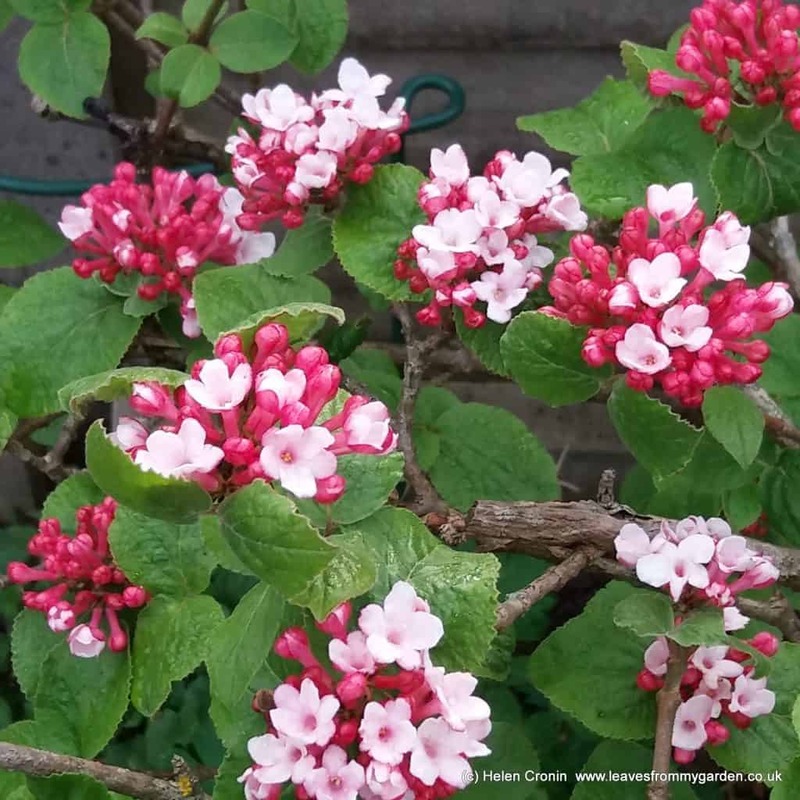 And that is the Viburnum carlessii ‘Aurora’. My plant came as a cutting from a Shrub in a Welsh garden over 25 years ago. It has been moved at least 4 times. The scent has to be the best in the whole garden. I absolutely adore it. It lasts for about three brief weeks. Each Spring I eagerly await the first glimpse of its apple-blossom pink buds. The first few flowers open, and I bend down to take a deep draught of its glorious scent. All too soon the flowers fade and the scent has gone and only the ‘scent-sory’ memory lingers. Have you a favourite scented plant? Do share; I would love to know the fragrance you enjoy most in your garden. Scented plants can also jog our memories – Why not read this post about Memory Jogging Plants? « The Pond has sprung a leak, again! 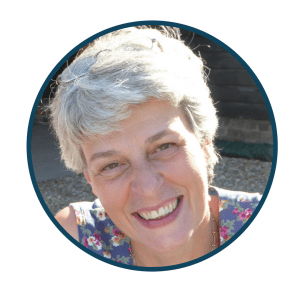 I loved this article Helen. On May 1st we had a BBQ in the garden and the whole time I could smell this amazing perfume which I thought was coming from the lilac bushes in our hedge. It wasn’t until my mother-in-law commented about the lovely smell coming from the ‘Lilly Of The Valley’ that I realised the gorgeous smell had been coming from a tiny forgotten corner of the garden where ‘Lilly Of The Valley’ runs wild! I love the scent of those pretty little blooms, mine have yet to flower. Sooo looking forward to those!